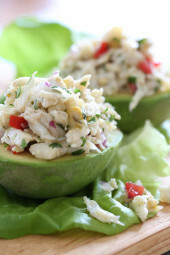 This stuffed avocado and lump crab salad is light and fresh, made with lime juice, olive oil, cilantro and red onion. So quick because there is no cooking involved! It’s refreshing and perfect for the Spring or Summer as a lunch or appetizer if you’re entertaining, you can easily double or triple this recipe, make the salad ahead and assemble just before serving. Here in Long Island, I’m lucky to have access to fresh crab in my neighborhood seafood store that’s already been cooked and cleaned for me. Don’t get me wrong, I’ve gone crabbing and you can certainly catch them and cook them yourself, but it’s so much easier to buy it ready. 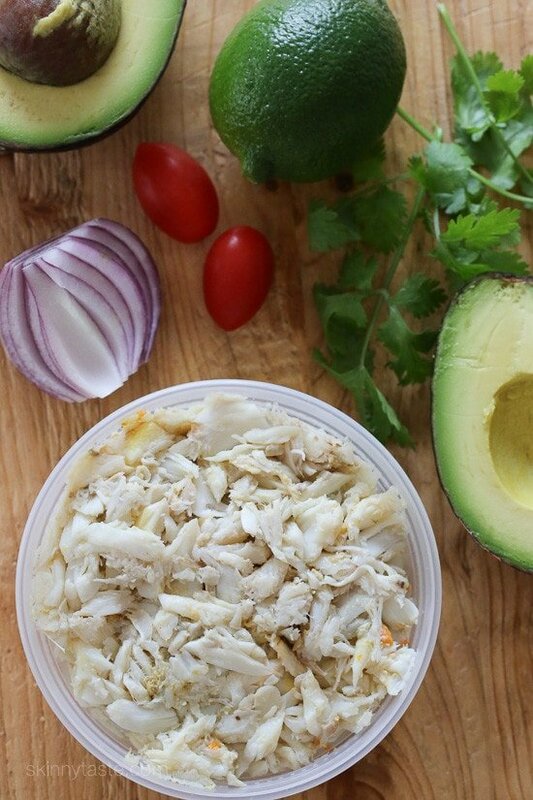 If you don’t live near the coast, canned lump crab can be used instead. This stuffed avocado and lump crab salad is light and fresh, made with lime juice, olive oil, cilantro and red onion. So quick because there is no cooking involved! 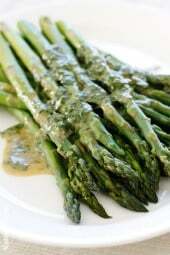 In a medium bowl, combine onion, lime juice, cilantro, tomato, olive oil, 1/8 tsp salt and fresh pepper, to taste. Add crab meat and gently toss. 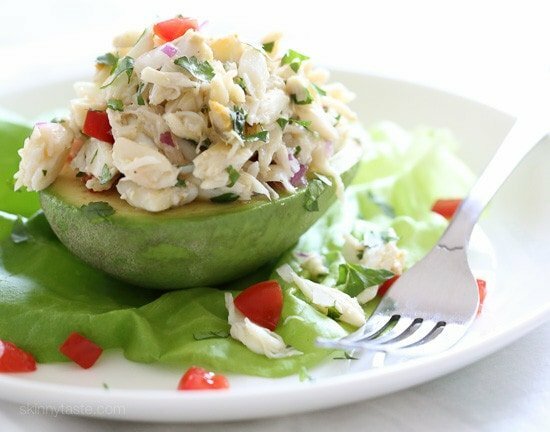 Season with remaining 1/8 tsp salt and fill the avocado halves equally with crab salad. 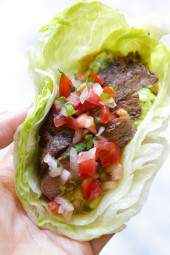 This makes 2 servings, place on two plates with lettuce if you wish and serve. can you used can crab meat? Oh. My. Stars. This was literally THE BEST crab salad I have ever eaten! I shared it with friends, and they agreed it was better than restaurant-quality. Instead of serving it in avocado halves, I chunked the avocado and mixed it into the rest of the salad immediately prior to serving. I had some unexpected guests coming for appetizers. I looked in my freezer and found that I had some Trader Joe’s frozen crab. In my fridge I always have avocado, limes and cilantro. I started searching on line for a crab stuffed avocado recipe, all the recipes had mayo in them and I am not a mayo fan! I put in without mayo and skinnytaste popped up! I should have known to check here first! This was so, so good! It’s delicious! I lightly grilled my avocado and yum!! I was happy that there was some of the crab mixture left and another avocado and it was even better the next day! Thanks Gina for wonderful recipes!! Gina, here’s something I have been wanting to ask. I really hate the taste of cilantro (and parsley) so I generally just leave it out, but is there another herb that would sub well for it? Thank you! Love your site!! i made it out of canned crab; fabulouso!! Is this fresh or canned crab? It doesn’t say to mix the avocado into the salad. Did I miss what you were supposed to do with the avocado? Maybe a missed step? I made this for supper last night…WOW it was amazing! Glad you enjoyed it Denise! I”m a little confused, do we eat the avocado or are we just supposed to use the shell. Photo looks like the avocado meat is in there, not scooped. Yes, you eat the avocado, shell is peeled. what if I didn’t want to use the avocado and just have the salad solo…what is calories, fat, protein, etc.? So, all I could find in my area was fake crab…I live in Montana. It was still mighty delicious and my kids LOVED it. I found out today that my local Costco has lump crab. Who knew?! So I’ll make it again next week with the real stuff. Thank you!!!! 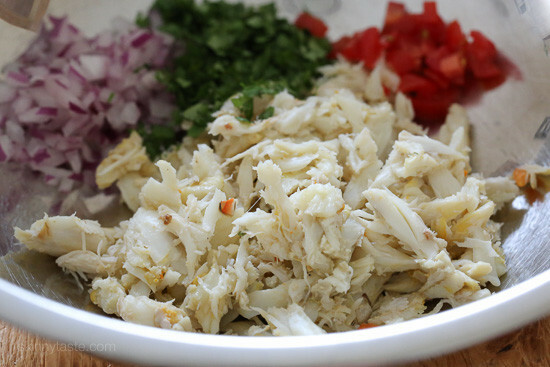 This has become my go to dish that I make at least once a week…I use lump crab meat that I get from my farmers market with no preservatives and it’s DELICIOUS! Sometimes if I don’t have the crab I will substitute cooked shrimp and it’s so incredibly good that way too. I find that sometimes I prefer it without the cilantro but I can’t say enough good things about this dish! I’ve switched to really clean eating lately and this is the perfect light meal that you can enjoy knowing that it good for you! Do you think this could be made with chicken? I do not like cram and I’m new to trying to cook healthy and am still a bit unfamiliar with all of this. Thank you in advance for you help! I love your site and many of your recipes!! I am enjoying this now as I type. It's a keeper! I love it and will be making if many more times. Thank you for sharing. This looks so appetizing! I will be making it soon. Not that I count points or anything, but is 1 serving, 1 half of the avocado? Love all the ingredients in this. Tried it for breakfast today. It was delicious! I chopped the advacado into the salad. Perfect over greens. Thank you Gina. Simple and delicious! This looks delicious however I'm watching my sodium intake… Is the sodium from just the crab meat alone? Anyway to reduce the sodium? Would rinsing the crab help? Looks delicious, Reminded me of the Peruvian dish called "Palta rellena" Stuffed Avocado, you can use tuna or chopped veggies. Yumm!! I'm on Long Island too! Where do you purchase seafood? Wow this looks amazing. Anything with avocado is right up my ally! Thanks for repeating this, Gina. I hadn't seen it yet and am eager to make it — because I LOVE crab! I love some of the other ideas in the comments – it reminds me that if I make extra, the next day I could do without the avocado and instead serve the crab salad on greens or stuffed in a pita — all very low point options! Yay! 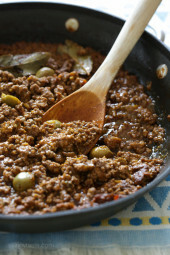 Thanks again for all your great recipes… I love your book and it's a definite go-to for me. I forgot to put "notify me", so, sorry for double posting…. I tell all of my friends about your blog. Most of the people I know are seriously overweight, so I love to cook your recipes in order to keep mine. Thanks, you are helping so many. Question: I live in Miami and much prefer our creamy local avocados. Do you know how they compare nutrition-wise with Hass? I read that Hass avocados have something that raises metabolism. could we add shrimp to the mix and if so…would the point value go up or remain the same? OMG just made this and it was so delicious. WOW new favorite quick snack Yummy Yummy. I personally loved it exactly with what the receipe calls for. My wife could do with less lime and no olive oil. Great recipe! I had some very ripe avocados that I needed to use and a package of imitation crab and this was the perfect use for them! I whipped it up within 15 minutes and just had it for lunch! So good! It'll probably be tonight's dinner too since I have left over ingredients. I did leave out the salt and used extra cilantro & onions and served it over a bed of romaine lettuce. This is delicious! I only had imitation crab, and I used that, but I can imagine it must be fabulous with real crab. I added a tomato to fill it out more as this was going to be our dinner. Easy, quick and I didn't have to heat up the kitchen! BTW, a serving is 8 PlusPoints. 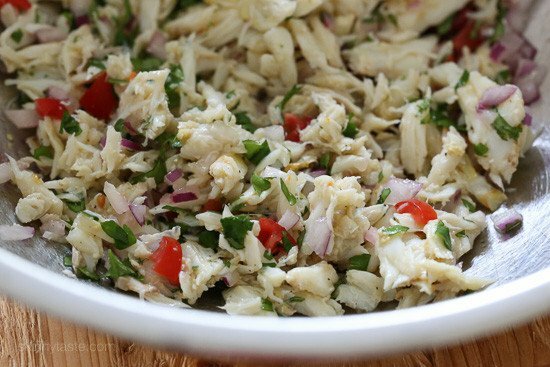 Can you use the crab meat that comes in a can or is it best to use real? Made it today for lunch, put it in a 1pt pita… DELISH!! This was delicious! I made this for my husband and I today for lunch and we will definitely have it again. We used fresh snow crab. Glad you liked it, I love this salad! I made this last night TOP NOTCH!!! Gina I stumbled upon your blog on a google mission to find more ww recipes, and OMAGOSH this salad is friggin AMAZING!!! SO delicious. Thank You so much. And your photographs are beautiful. I love that you serve it in the avocado “shell”…I do the same with guacamole. @Patrick, this one is a must! The flavors in this dish are awesome, and the photo is lovely! @Duo, yes, serving it over greens would make a nice lunch, can’t wait to make it again! This is EXCELLENT..I just made it, and I have no idea how I will not eat the whole thing!! This really only has a few ingredients in it too, so it’s so simple and light. It would be excellent over greens. 5ww points??? I cannot belive it!!! Thanks Gina. Is that 5 points for the entire amount? You don’t list servings, so I am assuming this is one serving? Love the presentation! Looks very tasty too!